← Have You Seen This Red & Black Bug? We’ve just come to the final chapter for IPM management of outdoor ornamentals in 2018. Leaves are nearly finished shunting nutrients back into stems and roots and there are still quite a few examples of the spectacular fall colour display we’ve enjoyed in many parts of the province. Think back to June, do you remember seeing discoloured, pimple-like spots on the foliage of pear trees? This is the Pear Leaf Blister mite (Eriophyes pyri). The mites overwinter under the outer bud scales where they are feed on the developing buds when the plant is dormant. By petal fall next spring, the mites will lay eggs on emerging leaves and the next generation mites will remain protected from predators within the leaf blisters. The mite is difficult to manage once it moves into the blister-like domiciles it creates by feeding on the leaf tissue in the early spring. This mite pest does not usually threaten plant health, but we’ve been seeing a lot more of it in southern Ontario. Management of pear leaf blister mite is most effective when applied in the fall, to treat the mites while they trying to find shelter in the outer bud scales. As pear trees retain their leaves later in autumn, sometimes we have to wait a little bit longer for more leaves to drop to maximize coverage on buds for next year. In the spring, delayed dormant applications of horticultural oil may also target any residual mites hiding in the bud scales after petal fall, but it is not as effective as fall-timed dormant oil applications. 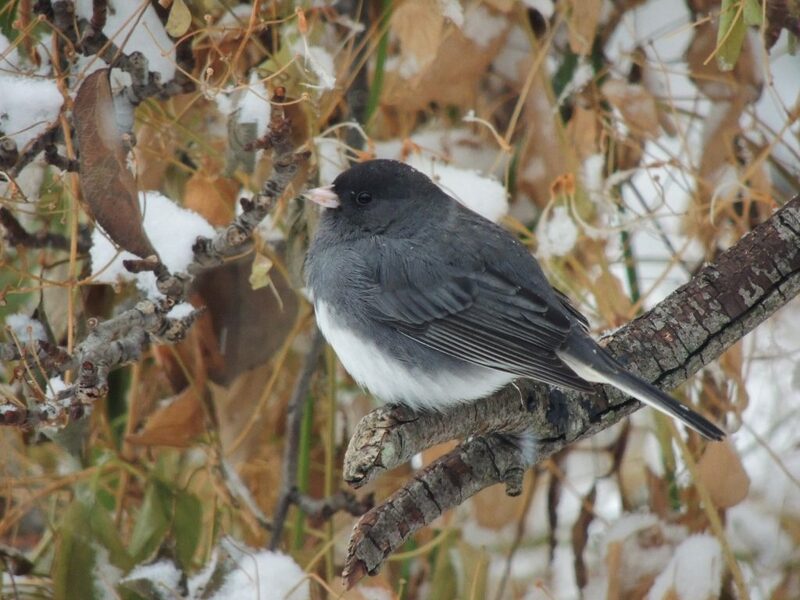 One of our favorite backyard winter birds is here….the Dark-Eyed Junco. Males and females are dark grey on top, with a white under belly (kinda like a penguin). Males are a darker grey than the females. They breed up north but will winter in flocks around southern Ontario. This time of year they don’t really sing, but they have a lot of low-key, funny little vocalizations that they make to each other that you will hear. 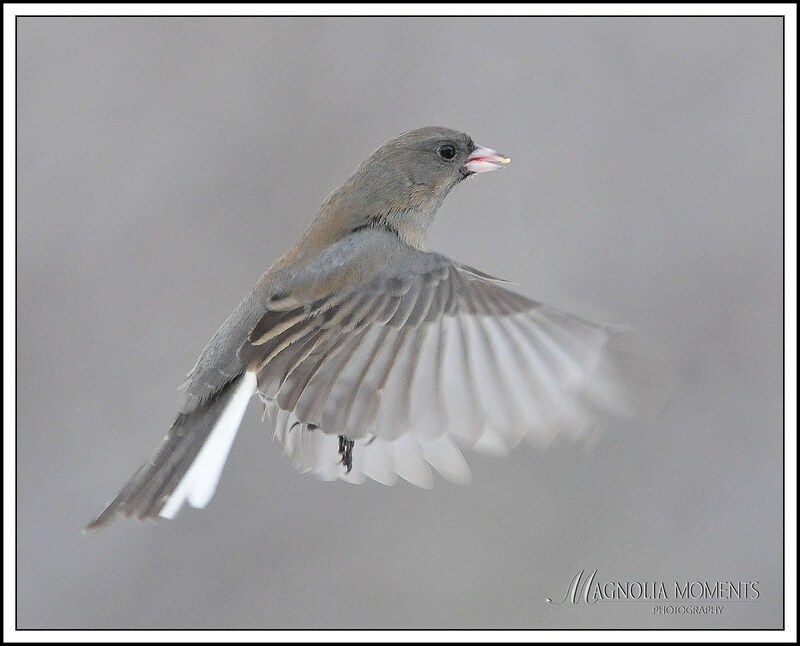 Dark-eyed juncos are most recognizable when they fly short distances since their outer tail feathers are white. This flash of white really catches your eye. They are ground feeders, to attract them simply spread black oil sunflower seed on the ground. They will come to hanging tray feeders over time. This entry was posted in Arboriculture, Insects, IPM, Nursery Production, Weekly Nursery Landscape Report and tagged bugfinder, Jen Llewellyn, onnurserycrops, pear leaf blister mite. Bookmark the permalink.